For those unaware, the little acronym above stands for Do-It-Yourself-Direct-To-Garment printing. In layman’s terms, printing your own shirts and designs. Commercial DTGs can cost anywhere from $5,000 to $10,000 which for the hobbyist who only wants a few shirts is ridiculous. So you would think this field of technology would be hacked to no end, but we’ve actually only seen one other fully finished and working DIYDTG. So we took it upon ourselves to build a DIYDTG as cheaply and as successfully as possible. We would like to take this moment to thank [makemygraphix] for his original designs, as ours is heavily based off his. And Tshirt Forums, for their valuable input. The printer you choose is the most absolutely crucial part of this hack. We took apart an HP DeskJet 3845, Canon iP1500, Brother MFC420CN, Epson Stylus Photo 820 and an Epson Stylus c40. Why so many? We literally purchased every printer the local thrift store had (at $6 a printer, it’s not that bad actually), that way the reader wouldn’t have to. Our findings were thus; the HP and the Canon both had rotary encoders on the paper feed shaft and ended up being a total peta to try to align and get working, both not recommended. The Brother was an all-in-one that would not function unless every part was connected, making it too large and bulky for our needs. 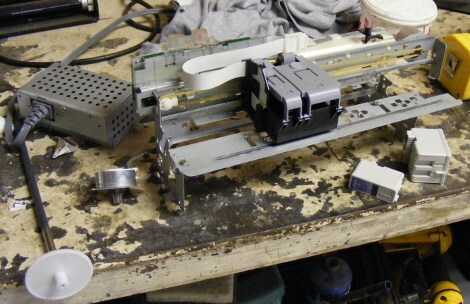 Both Epsons used stepper motors, were very easy to take apart, and only had one easy to manage paper sensor. Go with Epson! (We ended up using the C40 because it had the 3 ink CYM system instead of the 5 CYMLCLM system the 820 did). As for the ink you will be using in your printer, we found DTGinks.com to be a good resource. For software for your Epson, we found the default drivers worked well enough. There is RIP software out there, but we couldn’t find any that supported the c40. We will recommend the SSC Utility program though. Allowing you to quickly and easily lie to the printer about how much, what kind, and replaced ink cartridges (for Epson only). We started off by taking apart the printers. Every printer is different, so we can’t give you details but its relatively simple process. 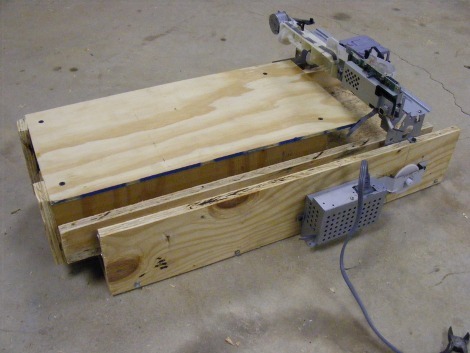 By the end you’ll only need the head and its carriage, the paper feed motor and its shaft, and the power supply. 1 x 26inch by 11 and 1/2 inches. 1 x 26inch by 10 inches. 2 x 26 inch by 1 and 3/4 inches. 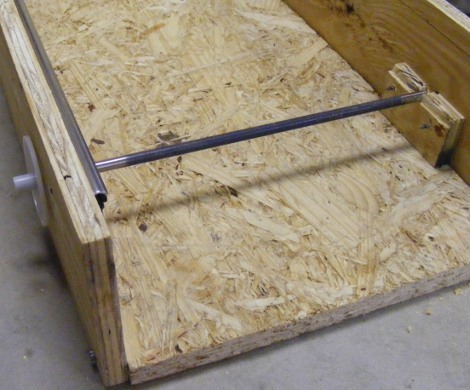 First clamp the two 26″x5″ boards together. Now 6″ from the end and 2″ and 3/8″ from the bottom drill a 5/8″ hole through both boards at the same time. This is where your paper feed shaft will go. Here is a tricky part, the metal track. We mounted the outer part 3/4″ from the top on one of the 26″x5″(doesn’t matter which you choose) pieces and made the stop/back/end of the track flush with the end of the board (this isn’t very high priority) . And the inner part of the track goes 1″ and 1/8″ from the top on one of the 26″x1 and 3/4″ pieces. Normally we do recommend that you use metal “L” brackets to attach corners of wood, but as long as you pre-drill a hole slightly smaller than your screws, you’ll be fine (we also counter sunk most of our screws, but that’s optional). 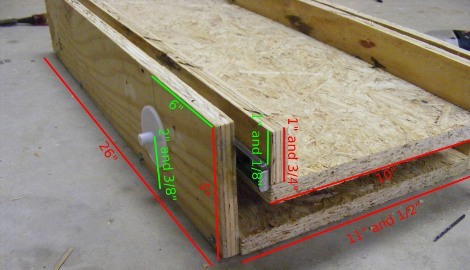 Attach the two 26″x1 and 3/4″ to the 26″x10″. Do the same with the two 26″x5″ and the 26″x11 and 1/2″ pieces. All that was a little tricky, so here is a picture to help out. For those wondering, the top tray rolls “towards” you in this image. And a shot without the top tray, as you can see our shaft wasn’t long enough, so a simple 2″x3″ piece was put in place. Make sure the shaft spins freely and without binding, with and without the top tray in. The next interesting part is mounting the drive motor. It needs to be snug against the gear of the shaft, yet not too tight to make it grind against the wood. It also needs to have a way of preventing the shaft from “popping out”. We solved both problems relatively simply. Take your assembly, remove the top shelf, and prop it on its side. 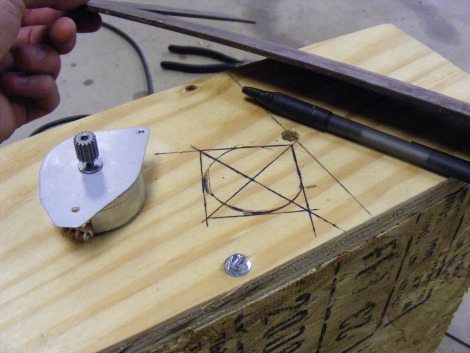 Position your motor where it will be mounted on top/inside the 26″x5″ piece. 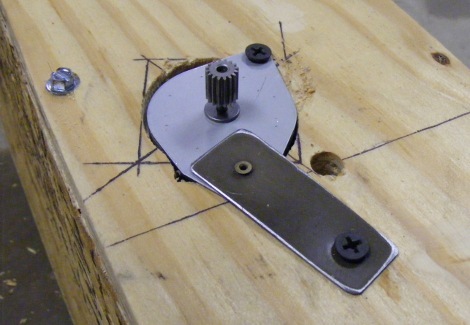 Drop in the shaft, get everything aligned and draw a circle around the motors base. Using a straight edge and tangent lines you can approximate the center of your circle. Use a large hole saw cut it out (it doesn’t have to be perfect). Sand/file it so the motor easily fits in without bending any pins. We pop riveted a 1″x3″ piece of aluminum to the motor to make mounting a little easier. Bare with me, we’re almost done! You’ll want to mount it on-top of the two 26″x5″ pieces about 6″ back. We were lucky and found two of the previous mounting screw holes on the carriage fit perfectly, however other printers you might need to bend or make your own. (This picture taken before we made our nifty “_n_” bracket). Mount your power supply and solder it, alongside your motor, to the driver board. Now there is one part we’ve neglected to mention until now. 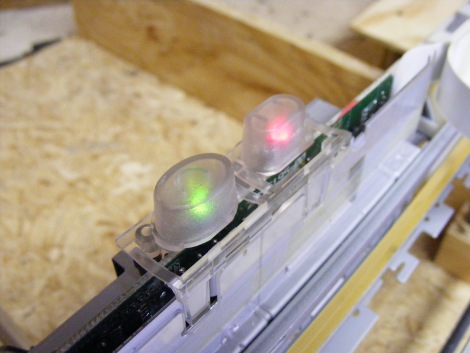 And that is the paper feed sensor (remember that one sensor we mentioned earlier?). Well it’s because we spent 3 days trying to get that sucker to work with our platen. 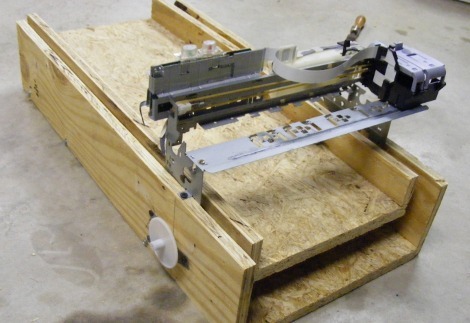 We tried everything, different timings and positions of the platen, even programming an MCU to try to trick the printer into thinking the platen was paper. In the end, we just broke it off. And it worked (no really!) It takes a little timing on our part but by hand to trigger the sensor, but we’ve never had a misprint like we did with the platen. (Pictured below, one of our “tape” attempts at triggering the paper feed sensor, this one worked about 1 out of 50 times). Send a print job, hand trigger the paper feed sensor, and we have a print! Here is just a short video if it in action, most notably you can see us hand triggering the paper feed sensor. The orange was a test print, as you can see if your platen isn’t 100% flat and level relative to the head, you’ll get some smudging and general print errors. The white shirt was a perfect (well, test) print that we did a little earlier. The youtube video appears to have been blocked on copyright grounds. Perhaps a music track? Looks like a great project though. good work. The website which blocked the video are mostly spammers and content thieves. This is probably just another way to get their name known. The tray rests on top of the paper feed roller and is moved back and forth only by friction? Did you modify the roller to give it better traction? Can you print also on dark colors? Is the ink opaque? You can but you need a printer that that you can replace a color with white pigment. Then you need software that knows to print the white first and then the other colors second. What does people eating tasty animals have to do with selecting a printer? Awesome. Does the ink wash out? This might go well with a print cartridge replacement hack. also have you tried washing the shirts yet? would love to see if it washes out smudges ruins everything else in the load etc. How permanent is this ink? Is setting it as simple as ironing the shirt afterwards or is it best to never wash it? Eew. Anyone have a link to that HAD logo on the shirt? Another mark in favour of (some) Epson printers is the use Piezoelectric print heads rather than thermal ‘bubble-jet’ heads. These are somewhat more accepting of alternate inks (or other fluids) than thermal heads. Where do you find these heads to fit the epson? I second Janins questions. 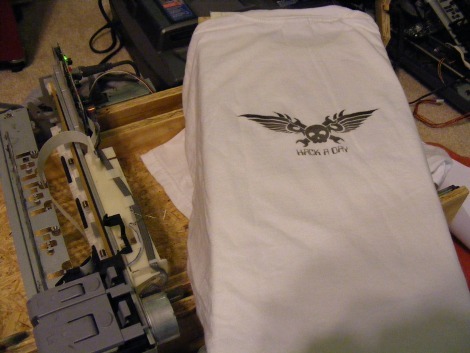 also what is the thing you stretch the tshirt onto and place on the platen? lol cant you buy USB kits for like $300? I am on my way building a DTG printer using an Epson Stylus C90. The internals are exact same to the one you’ve used. oh come on, this is not a dangerous project. Hacks aren’t necessarily elegant. Just something quick and dirty to see what you can do. This seems like a good beer fueled weekend with my buddies.I think it’s a nice proof of concept. Repurpose a printer into printing cute lil’ pitchures on dem dere shirts. I love it. I have like 8 Epson printers out in the shop. As soon as I get the fortyleven projects I am currently working on out of the way I think this will be the next one in the queue. It will be a great way to P.O.C. shirts this fall. Having worked in the DTG printing machine industry, I can confirm that many use an Epson printer as their base printer. The advantage of DTG over screenprinting is the detail and vibrancy of colors. You don’t waste it doing vector images, or compressed images, simple logos. Leave that to airbrushes or screen printers. Anyway, there is a reason for (some of) the cost. For one thing, custom ink. It took years of back and forth with the DuPont ink guys. Another thing is multiple passes. Also, DTG printers often use multiple passes of the same image. Both of these are to prevent one thing: Quick fade out. Screenprinting cracks after multiple washes. The aim of the DTG industry is to produce garments that fades no faster than the garment itself. Dunno if they are there yet. Oh yea, our paper feed was wired to a button as well. An important tip: If you plan on doing bulkier items like sweatshirts, put in a laser sensor to stop the machine if something is high enough to hit the head. Those bigger items are harder to get completely flat, and you DO NOT want to have to waste time cleaning the heads by hand of fabric. Lol! Did you guys use voice recognition to write this post? Looks like a great deal of fun to make, and reminds me that someone needs to set up a database of what parts can be scavenged out of what printers. 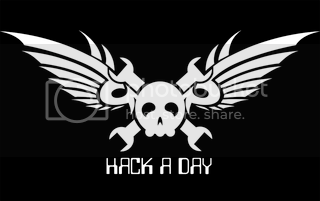 Where can I get that most awesome logo with the wings? Schweet! So badly wanna do this! But two questions: will a wash wipe/smudge off the ink, and will this work if I tear a part a Epson Stylus C64 printer? 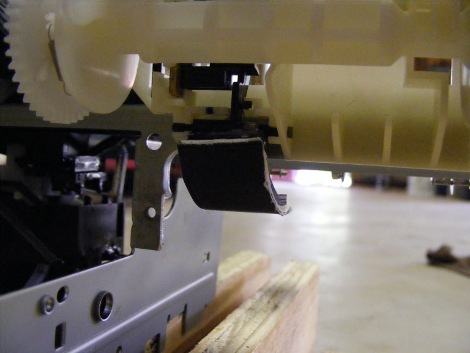 epson printers also have very nice steppers, hp’s have those cheap dc motors with optical positioners. Both can be used for makerbots/repraps/etc as well as for any project requiring high accuracy and repeatability. @janin: Yep, simply friction. We were tempted to add some non-slick grip tape but found it unnecessary. The darkest we’ve tried was a marine blue, it didn’t show up as well as we like. We’ll be sticking with light colored shirts. @mcmasterp: The white thing is just 1/8th inch thick cardboard because we miss-measured the legs of our platen. It helps put the shirt closer to the print head. @notahack: We can print in full color. @Doug: We lost a leg during the mod, we found it promptly later, but still be safe. Just casting my vote for a “how-to” on filling the ink cartridges. Even if it’s just a link to a good one. How hard would you say this hack is? Could a beginner handle it with some common sense and teh right epson printer? 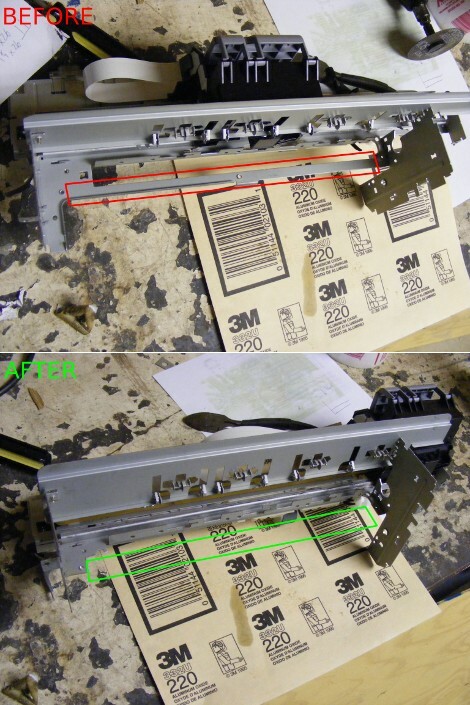 Does standard Epson ink (for paper) resist PCB etchant? Does the fabric ink resist etchant? A direct-print hack for printing masks for PCB etching would be a great boon to the Maker community. Have you heard of press and peel. All you need is a Laser printer, and some sheets of this blue stuff and you iron it on to the PCB. I noticed the DIY DTG you took a lot of the plans off of couldn’t print white ink for some weird reason. Have you guys tested white ink on black shirts yet with this? Could consider filling your ink carts with createx airbrush colors paint. it should be thin enough, and can be thinned further of course. It’s for fabric and just needs a heat treat with an iron afterward to be permanent. Not sure if it would fry the heads or not but worth a shot. How do you get the DTG inks into the right kind of cartridge? Looks like they supply ink for genuine DTG printers which I think have different cartridges. An EPSON Ink refilling hack would be much appreciated! Regarding printing light colours on dark fabrics: If you can get DTG ink in white (and I imagine you can) one way to do this would be to fill a black cartridge with white ink and print a negative of your image. In other words, if your logo is white – invert the colours using GIMP (or whatever program you use) so that it appears black and print the image with the white ink in the black ink cartridge. Theoretically you should be able to get lighter gradients of colours using this method as well. Of course, this is only half a solution as you wouldn’t be able to print ANY shades of colour requiring blacks. Would work for solid whites and some lighter colours though. Yes to the ink cartridge tutorial! And when you say ‘heat-pressed’, do you mean you ironed it or does this refer to a specific technique? Any idea on metallic or white inks? As I only like dark coloured cloths, that would be a necessity before I would get any use out of this. Check http://techref.massmind.org/techref/pcbetch.htm for info on direct-to-PCB printing. Exactly how durable is inkjet printed fabric? Heat Gun: apply heat at a low to mid-temperature setting no more than 300°F. Keep air moving to avoid blistering. Apply heat until paint is warm to the touch. Shirt Press: 325°F for 15 –20 seconds. Iron: With a protective cloth over paint, set on high/ cotton setting and iron for @ 2 minutes. A shirt press or iron is recommended for curing t-shirt artwork intended for washing. Again using createx paints is just an idea I had as an artist that uses them to airbrush. They come pretty thin already, as they are meant to be sprayed through a .5 mm tip @ 40psi. I do thin them for my .2 tip and I, of course, have no idea the size or manner that a printer head uses to expel it’s juices or if it could even throw paint rather than “ink” but @ about 4$ for 2 ounces of paint that is meant for fabric it would be a good thing if we could get it applied this way. The pigment is very fine and I think it would be very possible. The only downside I can think of is tip dry where the paint dries on the tip of my brush, or print head in this case, requiring a wet brush wiping the dried paint off now and then. Though I only have to clean the tip a few times during a whole helmet painting and I figure it could make it through a tshirt graphic without problem but a wipe of the heads after its done would probably be in order. Then again tip dry occurs because of the air pushing and drying the paint as it’s expelled and again I have no idea how a print head spits but I know it’s not compressed air so it may not tip dry at all. As for light colors on dark fabric; reversing and printing a negative is a great idea of course. But if the printer could indeed throw this paint one could very simply fill their black cart with white paint (or anything) and just let it spit the white onto the black shirt as if it were full of black. Plus, we hear you shouldn’t run water (and especially bleach) through a print head due to rust. @Simon: The hardest part was the wood work (well, and the paper feed sensor). There is no programming, very little soldering. With that, I wouldn’t say it’s beginner, but it’s not anything too majorly difficult. If you have all the parts (or can get them cheaply) it’s at least worth a shot. @DRa (and everyone asking about white): We have not tested white ink on black shirts, but from what we’ve read. By pre-treating the shirt, and using DTG white ink, you can print light on dark. For those wanting to try, follow Randall’s model. He’s on the right track. @Aaron: The website we ordered our ink off of supplied it in a small bottle. To all those asking, we’ll see if the big boss man will let us minions give you guys a quick tutorial on replacing ink in Epson cartridges. @cjl: Iron for a couple of seconds. @BioToxxx: Thank you for introducing us to Createx. Sadly, typical print head nozzle size is between 30 and 10 microns (from what we read, at least). And you mentioned it drys on your tip, not good for printers. I have a Dell 720 printer, does anyone know what type of motor it has? First off, this looks awesome, and I’m keen to give it a go (once you get an ink replacement tutorial up). Before I do, though – which size bottle(s) did you get, and how many single-colour shirts would you expect to get out of a single bottle of ink? Anyways, nice hack.. really love it.. and indeed a cartridge hack would be appreciated. I might just build one myself this summer (if I pass my exams). Now I think about it, it must be fairly easy to use this to print on.. everything (if you have the right ink)! @Jakob Griffith: If, for some reason, you can’t post a tutorial on filling the cartridges, can you email a tutorial? This AWESOME DIY project seems a little incomplete without one, am I right? It’s like selling a car without the keys!